We need volunteers for our missions. Our surgical missions are organized so that volunteers address both the surgical and basic health care needs of the communities they visit. 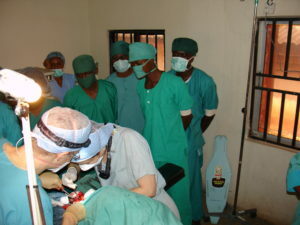 Surgical volunteers are conduct screenings and provide care to as many patients as possible. Though their work depends on the skills of volunteers and the needs of their patients, surgical volunteers will often remove tumors, cysts, and abnormal growths, and treat various infections. Local medical practitioners often observe these procedures to improve their techniques. Nonsurgical volunteers such as general practitioners and nurses visit nearby villages to conduct basic health screenings, provide medical care, dispense medication, and teach health topics such as proper hygiene, nutrition, and disease prevention.